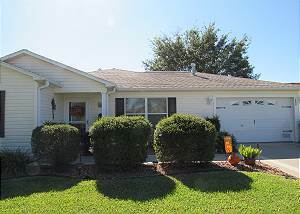 The Villages, Florida United States - GOLF CART 2 BEDROOM RANCH GREAT LOCATION THE VILLAGES FLORIDA | RE/MAX PREMIER REALTY Inc. This unit has a enclosed lanai with an entrance from the master bedroom. It has a washer & dryer and queen beds in both bedrooms and has very good privacy from your lanai where you can sit an enjoying Florida evenings. Flat screen TV in the living room and TV's in each bedroom. It is convenient to Southern Trace shopping mall with Publix, Bealls, several restaurants, banks, library and numerous other businesses near by. Close to the neighborhood pool and Post Office. Spanish Springs and Sumter Landing Squares are a short distance by Golf Cart or car. This unit includes a Club Car golf cart to make getting around a fun experience. Includes all utilities, gas, electric Wi-Fi AND Direct TV Now along with streaming device. Patricia P. from Brocton, NY United States recommends this vacation rental. It was a charming charming, two bedroom in a lovely quiet neighborhood. We had easy access to a supermarket, restaurants, golf and Pickleball. The house included everything to make it a lovely home for the month we stayed. Thank you for your response! Come back to see us. A guest from Greenville, IL United States recommends this vacation rental. Very pleasant rental experience. Property management is very professional and courteous. The location is in a central and very desirable location. A guest from Aventura, FL United States recommends this vacation rental. Our month long stay in the Villages was most enjoyable.The house that we rented was beautiful, and comfortable. I shall miss the Solar light in thr kitchen, I kept on looking for the wall switch to turn it off. The house was clean,lots of towels and everything else to make our stay enjoyable. My only complaint was, no instruction manual for the Microwave Oven, and the Toaster Oven. The instructions for the Computer was not helpful at all, to turn it on or to get on line.